DESCRIPTION: Now you can make fresh soft cheeses at home! 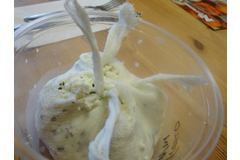 In this hands-on class you’ll learn techniques for creating ricotta and mozzarella cheeses. Discover how easy and fun it can be to influence flavors as you prepare these luscious cheeses in your own kitchen.